No matter where you live you can always find a restaurant that will serve you a great shrimp dish. However, depending on where you live, you might have to pay top dollar to enjoy that great shrimp dish. Don't waste your money having a restaurant prepare you a fancy seafood supper, cook one for yourself at home. Cooking at home is cheaper to do, and let's face, it's more fun to do. The taste of shrimp is unlike anything you've ever tasted and enjoy that wonderful taste in the comfort of your own home. Get the cutting board ready, get your water boiling, and join us to cook 15 Restaurant Copycat Recipes For Shrimp. Red Lobster has some of the best seafood around. Even though the word "shrimp" does not appear in the restaurant title of Red Lobster, the restuarant still knows how to cook up some amazing dishes with shrimp in them. 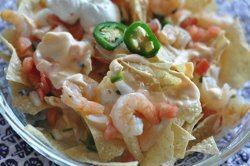 From Shrimp Nachos to Shrimp Gazpacho, these recipes for shrimp are killer. And if you really want to add to your Red Lobster experience at home, be sure to check out our recipe for Red Lobster Cheddar Bay Biscuits. Shrimp and pasta go together like peanut butter and jelly. OK, maybe they do not go together that well, but they still make an amazing combination. A crisp and juicy shrimp laid on top of a warm bed of pasta topped out with a smooth and creamy sauce is just divine. 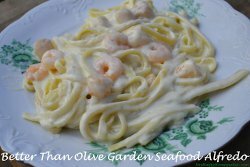 These recipes for shrimp and pasta are amazing dishes for both a romantic night in or an average, busy weekday evening with the family. Red Lobster is not the only restaurant in town that serves up incredible tasting shrimp dishes. Resturants like Outback Steakhouse has their own Aussie take on the prawns as well as others like Olive Garden, Bubba Gump, and Panda Express. 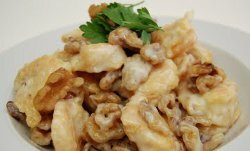 There are a lot of resturants that serve these scrumptious sea creatures and now you can enjoy many recipes for shrimp in the comfort of your own home.